Spanish-based design company Halwor have created a new everyday backpack specifically designed for cyclists which includes integrated lighting for extra safety at night. Watch the demonstration video below to learn more about the ROOUND cyclist backpack which is being launched via Kickstarter this week to raise the €22,000 required to take the design into production. Halwor was born a little more than a year ago with one clear aspiration: to turn cyclism into a truly competitive means of transport for the cities of tomorrow. Unlike other vehicles, bicycles are ideal for short commutes of about 2-3 miles, and we believe that as cars get pushed out of city centres, bicycles will increasingly be more adopted as the transport of choice. Just like it is now in cities like Copenhaguen or Amsterdam. But there are many challenges on the road ahead. Safety is still a major threat for cyclists all across the community, and to achieve our aspiration, we wanted to start from here: something that could vastly improve cyclists safety on road, making them more visible to others. This is how Roound was born. 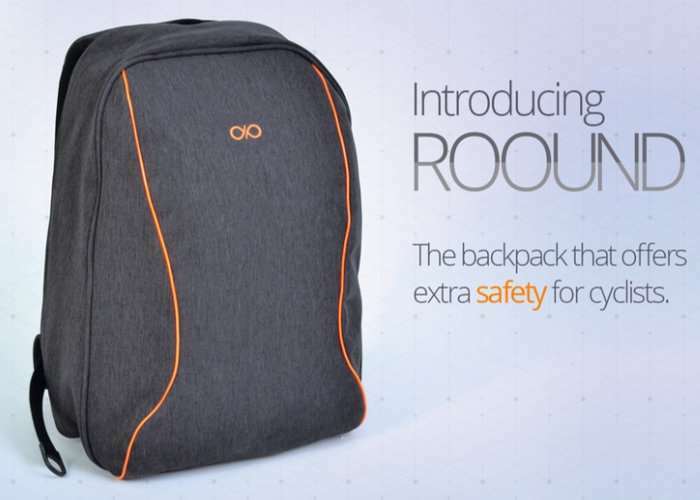 Roound is the first highly functional, beautifully designed backpack with incorporated lights that offers extra safety for cyclists. Visit the official Kickstarter campaign using the link below for more details and to make a pledge from €75 for earlybird backers with delivery expected to take place during December 2017 to certain countries.